My husband was a big man. He was 6’4″ tall and weighed 300 lbs. We wanted nice patio furniture, but couldn’t find a thing that we thought could handle over about 200 lbs. We decided we would have to build our own and that project went on his To-Do list. We had built shelves, we’d stained and installed our own baseboards and we’d built our own storage chest ottoman. We’d built them together, but he was always the brains, strength and know-how behind each project. 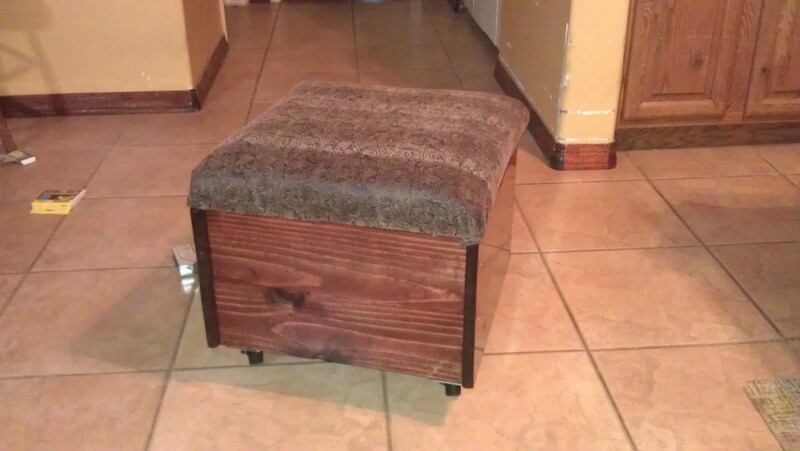 I decided to tackle one of the building projects he’d wanted to do and my son, John, and I made another storage chest ottoman, using the old one as our guide, for the den. After we got that basic box and lid figured out, we got cocky and started making plans for all the great furniture we’re going to build. I also started looking at Craig’s List for less expensive materials because even though building that ottoman was less expensive than buying a good quality one, it was still too expensive for me to continue buying all the materials at Home Depot. I checked Craig’s List twice a day for 3 days before an ad appeared. An elderly man was selling a side yard full of all size lumber for 60.00. Soon I had a side yard full of lumber in my pick up truck and on the way home. While we were making plans for that lumber, another ad appeared on Craig’s list. 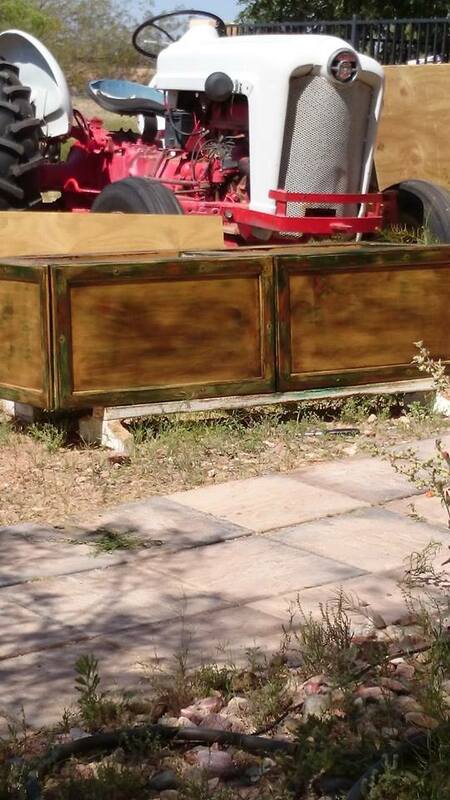 This time a fellow was selling used cabinet doors 2.00 ea. I took one look and called. Came home with a pickup bed completely jammed full of oak cabinet doors of varying sizes. 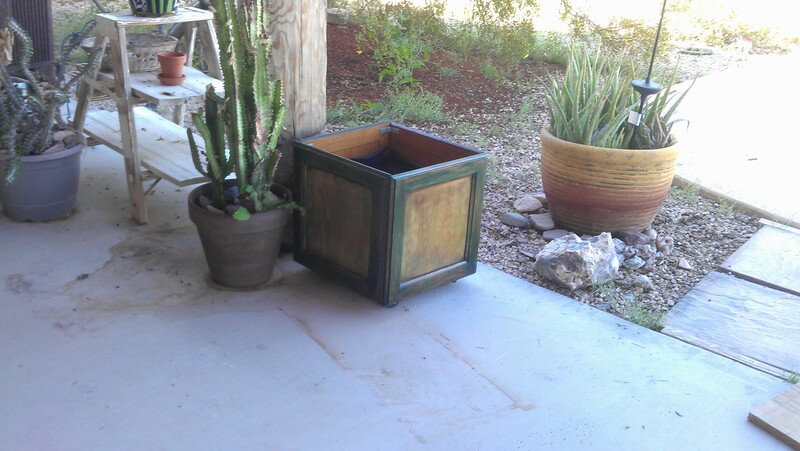 With some of the smallest doors I made this planter box. First I sanded the old cabinet finish off, then painted with green house paint on the frame, painted with Behr Apple Butter paint on the insets, then sanded over the whole thing again to expose some wood. Then I went over each door with Min-Wax Espresso stain and let it soak in for about 10 minutes before thoroughly wiping the stain off. After that cured and dried I applied 3 coats of Spar Urethane to hold up in the AriDzona heat and sun. We put casters on the bottom so we can easily roll it out of the way or into a different spot after it’s filled with wet dirt and plants. Then we got really cocky and decided it was time to try building a storage bench. We used the same paint/stain technique and used larger cabinet doors. This required a little thought because we were trying to build the bench to fit the cabinet doors, so none of the online plans we had found earlier on were useful to us. We plan to build at least one more of these benches. They will have cushioned tops, much like the storage chest ottoman, but the cushion and cover will have to be of weatherproof materials. We believe we have a handle on a brilliant weatherproof cushion cover (brilliant in all ways, including cheap to free), but need to find an inexpensive source of mildew and mold resistant foam. See the post about the Techno-clutter for another great use of the reclaimed cabinet doors and lumber. 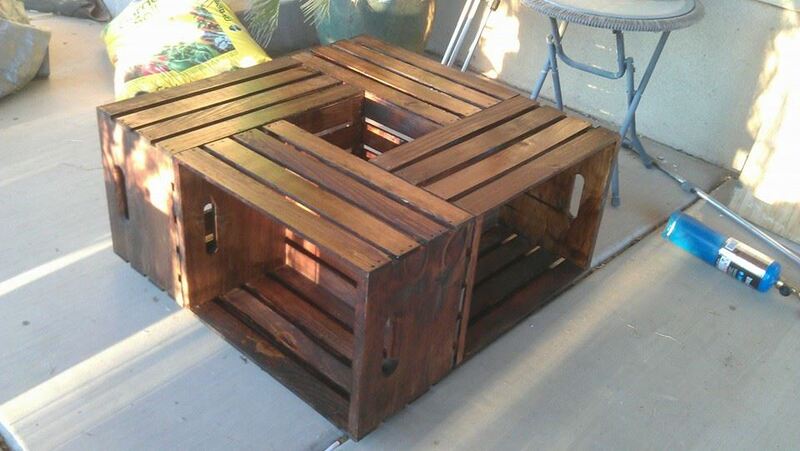 The other project we’ve done so far for the patio is a coffee table made of four inexpensive craft store crates and a square of reclaimed plywood. I stained the crates with Mission Oak stain and gave them 2 coats of Spar Urethane. I still have oodles of wood and cabinet doors left. Plenty for another bench, a picnic table, a surround to hide our messy bbq grill, several more planter boxes, a nice wooden bench with a back, and several other projects that are rumbling around in the back of my mind. All for about 160.00 thanks to Craig’s list, some elbow grease and ingenuity.